Republican and Democratic parties have become poisoned by their monopoly position, Libertarian candidates say, offering alternative. Scott Sommerdorf | The Salt Lake Tribune Gary Johnson, Libertarian candidate for President, left, takes the mic from his running mate William Weld at the University of Utah Student Union, Saturday, August 6, 2016. Scott Sommerdorf | The Salt Lake Tribune Barry Short, running for Utah's Lt. 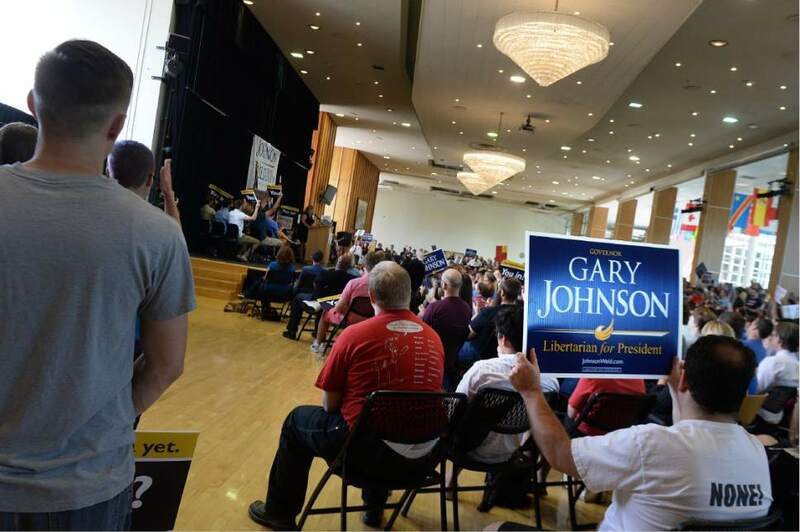 Governor with his running mate Brian Kamerath whips up support at a rally for Gary Johnson, Libertarian for President at the University of Utah Student Union, Saturday, August 6, 2016. 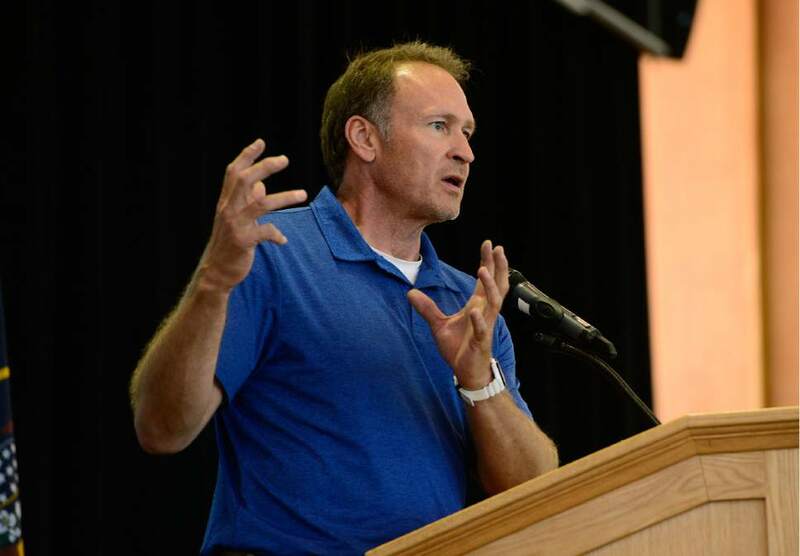 Scott Sommerdorf | The Salt Lake Tribune Utah Senator Mark Madsen, R-Saratoga Springs, speaks in favor of Gary Johnson, Libertarian for President at the University of Utah Student Union on Saturday. Scott Sommerdorf | The Salt Lake Tribune Massachusetts Governor William Weld speaks at a rally for Gary Johnson, Libertarian for President at the University of Utah Student Union, Saturday, August 6, 2016. Scott Sommerdorf | The Salt Lake Tribune Gary Johnson, Libertarian candidate for President speaks at the University of Utah Student Union, Saturday, August 6, 2016. Scott Sommerdorf | The Salt Lake Tribune Gary Johnson, Libertarian candidate for President speaks at the University of Utah Student Union on Saturday. Scott Sommerdorf | The Salt Lake Tribune Supporters cheer at a rally for Gary Johnson, Libertarian for President at the University of Utah Student Union on Saturday. Scott Sommerdorf | The Salt Lake Tribune Gary Johnson, Libertarian candidate for President strides in to speak at the University of Utah Student Union, Saturday, August 6, 2016. 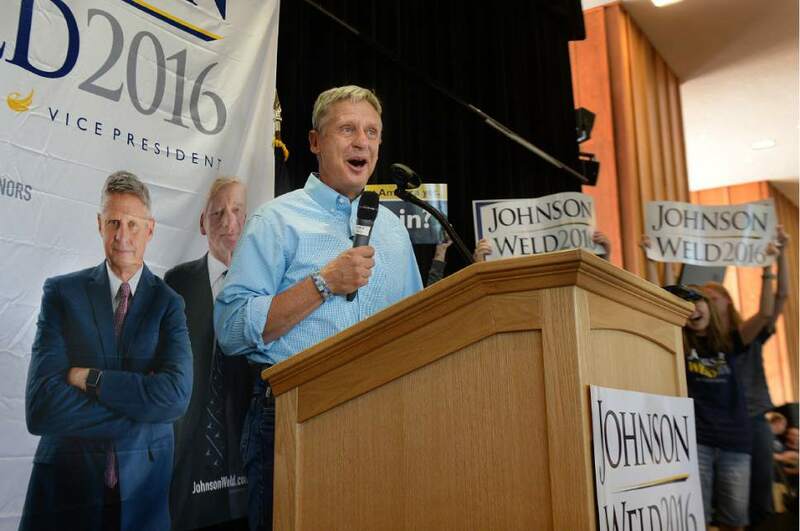 Scott Sommerdorf | The Salt Lake Tribune Massachusetts Governor William Weld speaks at a rally for Gary Johnson, Libertarian for President at the University of Utah Student Union, Saturday, August 6, 2016. 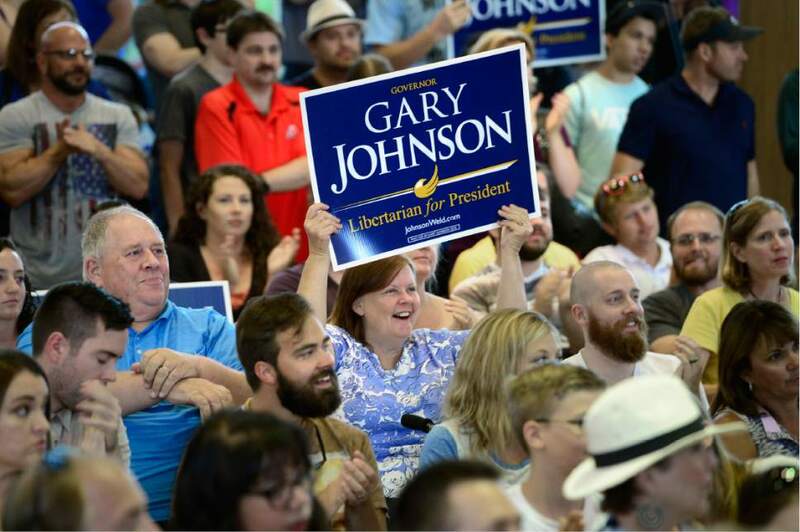 Scott Sommerdorf | The Salt Lake Tribune Supporters cheer at a rally for Gary Johnson, Libertarian for President at the University of Utah Student Union, Saturday, August 6, 2016. If either Democrat Hillary Clinton or Republican Donald Trump win the presidential election this November, Gary Johnson said Saturday, the U.S. government will become more partisan and divided than ever. But a third-party president, leading a multipartisan administration, could call out a gridlocked Congress to collaborate and represent the will of voters, Johnson said. "I do believe that most people in this country are Libertarian," Johnson said. "It&apos;s just that they don&apos;t know it." 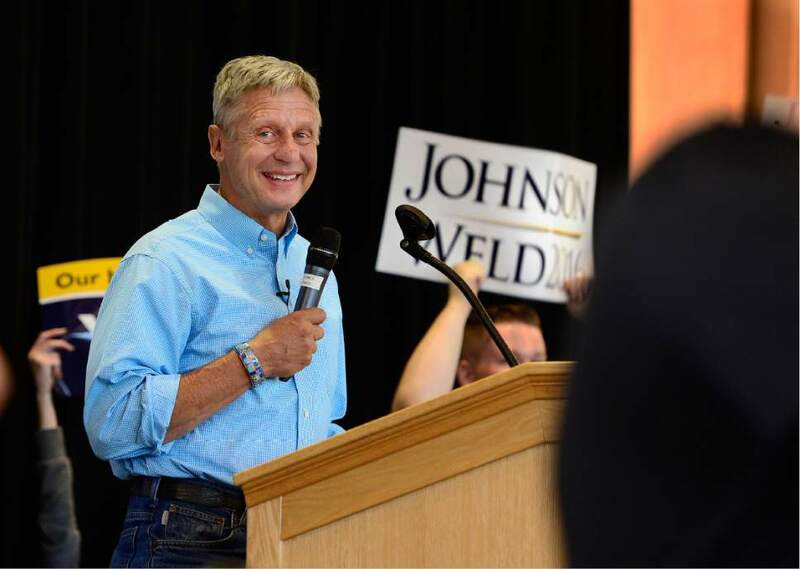 Johnson, the Libertarian Party&apos;s candidate for U.S. president, paid a campaign visit to the University of Utah on Saturday, speaking before an energetic crowd of several hundred. He was joined by his running mate, former Massachusetts Gov. William "Bill" Weld, who echoed Johnson&apos;s pitch that a Libertarian ticket could thaw the country&apos;s seemingly frozen legislative branch. "The two [major] parties have become almost poisoned by their monopoly positions astride the power horse of Washington," Weld said. "They seem to only exist now for killing each other off." 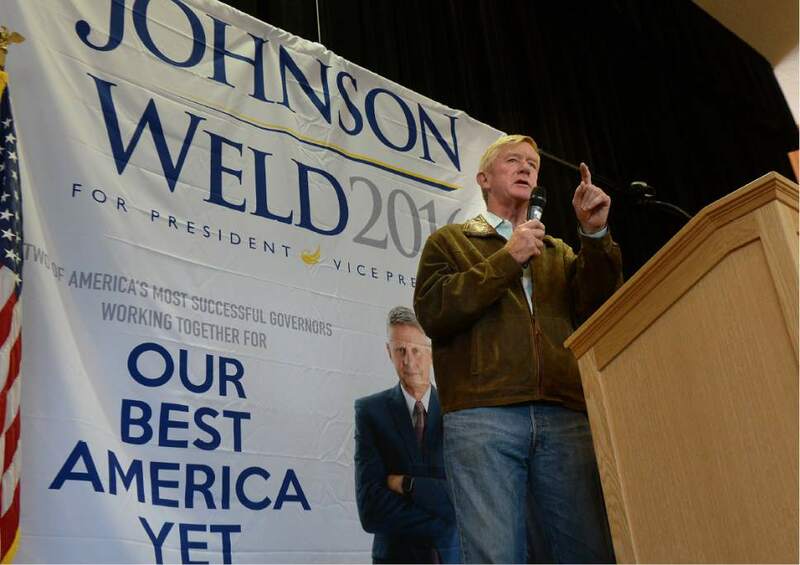 Under a Johnson presidency, Weld said, White House initiatives would not be summarily dismissed out of partisan rivalry. "It won&apos;t arrive all highly charged and guaranteed of dead-on-arrival opposition from half the people of congress," Weld said. Johnson touched on a broad spectrum of issue positions in his speech, which ran a little short of one hour. He emphasized the benefit of a free-market approach to everything from business to education to health care, saying most services should be provided in the gig economy format of Uber and Airbnb and that minor healthcare procedures could be handled by "Stitches R Us" and "X-rays R Us." He spoke in favor of term limits for elected officials, school vouchers, interest rate caps for student loans, a non-intervention military, and ending income and corporate tax in favor of a federal "consumption" tax. "If we had zero corporate tax in this country we would absolutely create tens of millions of jobs," Johnson said. "The more money you make the more money you consume – that&apos;s how a consumption tax would work." Johnson said he "absolutely" supports an individual right to own guns, with the caveat that he&apos;s open to dialogue about keeping weapons out of the hands of terrorists and the mentally ill. He described the death penalty as "flawed public policy," said obtaining a work visa should be "as easy as possible," and expressed support for legalized abortions and marijuana use. "We have tens of millions of Americans who are convicted felons who, but for our drug laws, would be taxpaying, law-abiding citizens," Johnson said. He also apologized for having his "head in the sand" in the past on the issue of police brutality toward people of color and other minority groups. Smartphones are now the "number one law enforcement tool," he said, and have exposed trends of disproportionate force that must be addressed. "We have issues but we can work through these issues," Johnson said. "And in that context, black lives matter." Salt Lake City resident Valoree Dowell attended the rally and said she can&apos;t vote for either of the major party candidates, but plans to support Johnson in November. "He and Weld together offer a path up the middle that is honest and experienced and practical," Dowell said. "Nobody else does that." As a registered independent voter, Dowell said she appreciates Johnson&apos;s approach, which emphasizes dialogue and cooperation. "I don&apos;t really vote for a party, I vote for the candidate," she said. "That&apos;s another reason this guy appeals to me. There&apos;s no party there, it&apos;s just &apos;do the right thing&apos;." Park City resident Nick Coleman said he will likely vote for Johnson, but has not made a definitive decision on who to support. "The two [major party] options have proven to have poor track records," Coleman said. "I&apos;m kind of looking for an alternative." Justin Conlin said he plans to vote for Johnson, despite a difference of opinion of several issues. Conlin said he enjoyed the rally, and liked Johnson&apos;s comments on immigration and tax reform. But he added that the Libertarian candidate supports a higher level of government regulation and intervention than voluntarist voters like Conlin are comfortable with. "I&apos;m a lot more pure in my Libertarian beliefs," Conlin said. "But they make some excellent points and I think they&apos;re the best option we have available right now." 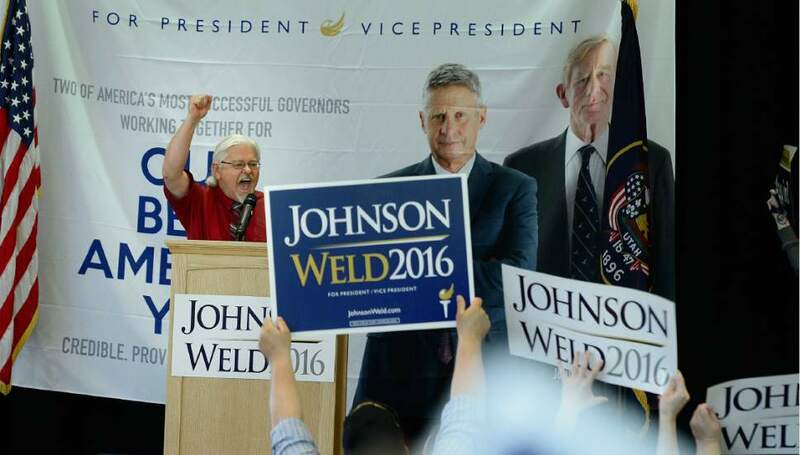 During the rally, Barry Short, Libertarian candidate for Utah lieutenant governor, spoke to the concern of some party members that Johnson is not sufficiently Libertarian. The candidate was reportedly booed at a party debate in May when he answered that he would have signed the Civil Rights Act of 1964 and recently said that one of the government&apos;s roles is to protect against discrimination. "We don&apos;t always agree on every single thing but here&apos;s what we do agree on," Short said on Saturday. "The solution to every issue that faces us is not more government – the solution is more liberty." Johnson has polled well in Utah, where distaste for both Clinton and Trump has pushed support for the Libertarian ticket. The Johnson campaign is also headquartered in the Beehive State. Weld said a critical goal for the campaign is to gain access to the upcoming presidential debates, which traditionally requires the support of roughly 15 percent of voters. The RealClearPolitics average of national polls currently shows Johnson with 8.9 percent. "Momentum is on our side," Weld said. "I think the month of August is going to seal the deal." During a media conference before Saturday&apos;s rally, Johnson acknowledged the long-shot nature of his campaign, but said the Libertarian ticket should not be seen as an also-ran. "I understand the odds against this," Johnson said. "But neither Bill or I would be doing this if there weren&apos;t the opportunity to win." 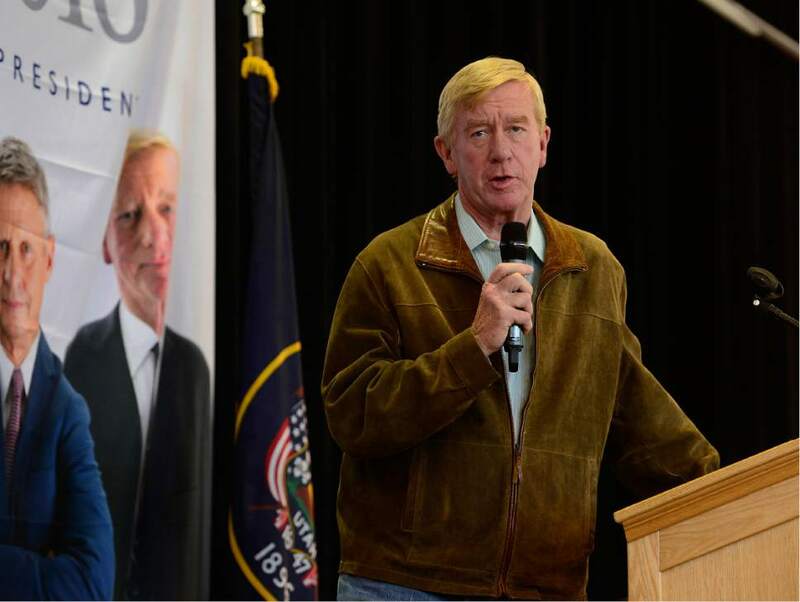 Weld agreed, saying the polarization and increased partisanship of the Republican and Democrat parties creates an opening for a moderate candidate to capture a national consensus. "The Democratic Party is not fiscally responsible and the Republican Party is not socially inclusive," Weld said. Johnson largely steered clear of attacking his opponents during Saturday&apos;s rally. At the end of his remarks, he offered a jab at reports that Trump had recently asked a mother to remove her crying baby from a campaign event in Virginia. "I want to thank all of you mothers for bringing those crying babies here," Johnson said. 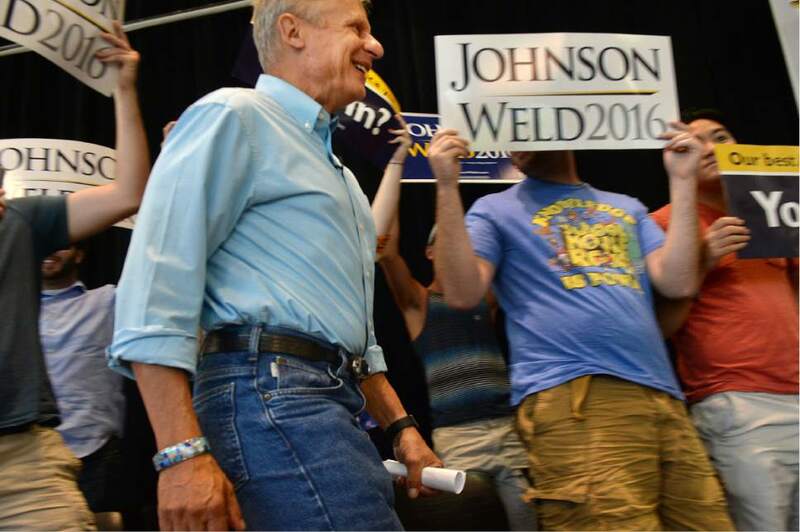 And Weld said he is looking forward to his role in prepping Johnson for the upcoming debates. 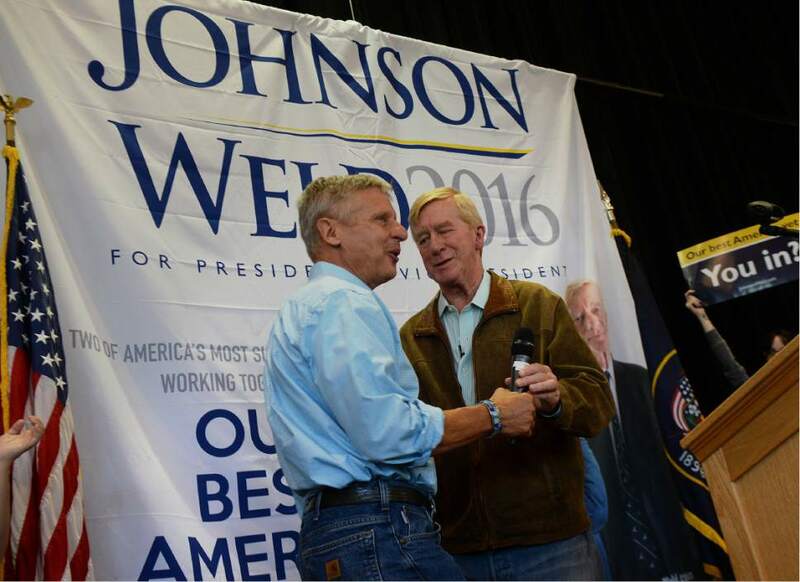 "I&apos;m going to play Donald Trump to accustom governor Johnson to bluffery and buffoonery and insult and distraction," Weld said.